Seeing is Believing This sample manual to teach Workplace Essentials is in MS Word format. Developing a sense of commitment and responsibility in your employees is best done through education. There is no more effective way to introduce personnel to an organizational value system than to offer them quality training. Our Workplace Essentials Bundle compiles a variety of titles, all focused on improving and encouraging organizational development. 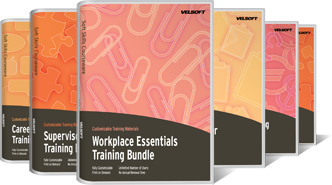 Our Workplace Essentials Bundle gives instructors the best training materials for introducing foundational workplace values and principles. You can feel confident that the course content that you deliver will instil a sense of responsibility and obligation within your students. As you know, training employees is an important investment. We’ve arranged our Workplace Essentials Bundle to include themes that explore all areas of personal development and accountability. Your students will be participating in scenarios that reflect their actual experiences, as well as inspire them to imagine the experiences of others. In this way, you will be teaching your students how to develop an awareness of their workplace environment. The training materials included in our Workplace Essentials Bundle have been professionally written to give you the tools for change. Inciting change in your workplace means pro-actively deciding to interrupt traditional (and sometimes out-dated) procedural methods and designs. Our training materials are fully customizable; meaning you can align your instruction of information, with an overall strategy or organizational goal.